What is better? A horizontal 3 panel comic strip, or a vertical 3 panel strip? Commemorating Star Wars Day, back in 2009, i did this strip. I was playing with the Photoshop settings and was learning to render “realistic” looking lightsabers. Scott McCloud has a very interesting treaty on “The Infinite Canvas” and how it could benefit Webcomics. Take a moment to go and read what he has to say. 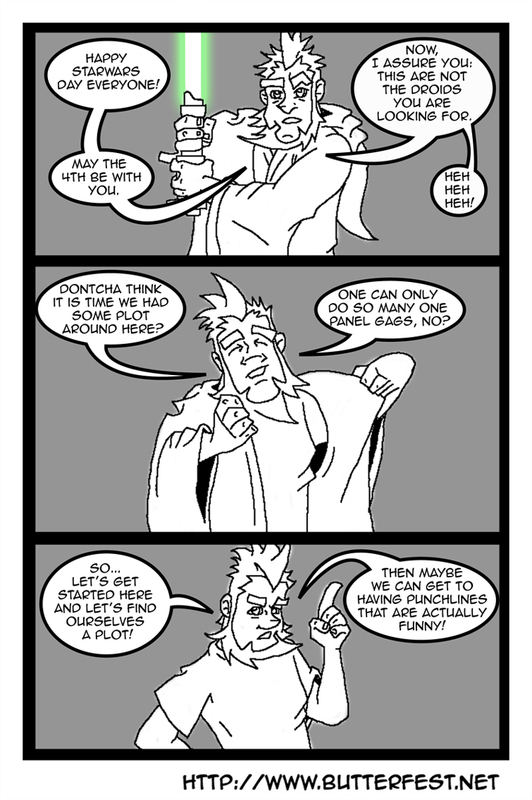 While i like that idea very much… the amount of planning and pre-production needed to successfully pull that on my first try at Webcomics would be way too much. And although a vertical 3 (or 4 or 5 or 6…) panel strip allows me more room to illustrate what i want, it forces the user to go “below the fold”.